What do kids know about creating a company anyway? Well, 3 24-yr old Brown University ('08) grads didn't know how to do it the "right" way, so they did it their way. They started Runa, a Fair Trade tea company. In less than 1 year, they've built the world's first guayusa (why-you-suh) factory, received grants from USAID and Ecuador's Ministry of Exports as well as local Ecuadorian governments, built a 20-person team of forestry engineers and agronomists in the Amazon and work with over 600 indigenous farmers. They have a formal partnership with the indigenous federations in the Ecuadorian Amazon, Fundacion Natura (largest conservation NGO in Ecuador). Not bad for 3 kids from suburbia huh? So, kids from suburbia set up a company in Ecuador? What gives? Tyler Gage, co-founder and President, had spent the last 5 years working with indigenous communities in the Amazon creating Fair Trade initiatives and working on cultural preservation. Tyler has the unique ability to translate indigenous cultures' traditions, rituals and values into modern day life. And he does play a mean game of soccer, having been on the NCAA Div I top ranked soccer team at Brown (yes, Brown can excel in sports :) ). Dan MacCombie, co-founder and VP of Ops, has worked in conservation and public policy. Dan is also a photographer and scuba diver. He serves on the board of the Ostara Foundation which creates innovative models for sustainable development and community growth. So you can go from the suburbs to the forest and blend both worlds (just like blending tea). From these talents, experiences and strong passions, the guys created Runa. Runa is the first company to bring guayusa beverages to the USA. Guayusa is a very healthy leaf grown in the Amazon: high in antioxidants, vitamins, amino acids and caffeine. Unlike green and black teas or yerba mate, guayusa has no tannins so it has a smooth rich taste with the bitterness or astringency of other types of teas. Runa's products are specialty blended teas (bags and loose), energy drinks and soon, ready-to-drink bottles. Recently, Whole Foods signed to distribute Runa in their stores! The overall specialty tea and energy drink market is about a $14B market. The success of acai berries, from Brazil, shows how well this market is doing. Industry trends and studies project continued growth of healthy, 'green', exotic drinks. Through Runa's Ecuadorian export company, Runatarpuna Exportadora S. A., Runa is working with hundreds of farmers, managing the only guayusa factory in the world which assures consistent product quality. They guarantee fair trade prices and agricultural assistance using non-traditional funding streams (e.g, development agencies, local governments, philanthropies). Runa as built significant barriers to entry in the supply chain with 5yr rolling contracts and deep local knowledge. Runa started with 3 suburban kids with a passion for the outdoors (Tyler, Dan and Charlie) and experience in the Ecuadorian Amazon. While they loved working with the indigenous communities and helping them preserve their way of life, it was a particular ritual that captivated their attention and solidified the formation of Runa. The indigenous farmers with whom they stayed woke them at dawn to share in a morning ritual drinking guayusa together by dipping gourds into the large clay pot boiling over the communal fire. During these early morning hours, the communities share dreams, music and myths in a tradition they say makes them "Runa" - which means "person' or "fully living human being' in the Kichwa language. The students chose this name to represent their company's commitment to realizing a dream of living responsibly, collaboratively, and intelligently as a global community. The students and indigenous farmers created a business that respects cultural traditions, supports small farmers, and helps the Amazon rainforest thrive. Runa inspires people to live a stimulating life and use their energy and imagination to create a better world. “Runa” is a term of immense pride, identity, and spiritual vitality for the Kichwa people, but it's connotation in modern Ecuadorian society has become a derogatory racist term meaning “stupid and worthless.” The students want to regain indigenous cultural identity, traditions, and plant knowledge on an international scale by using Runa as the brand name for all their products and a symbol of their commitment to living fully as humans. Plants and teas, have always served as central points of relationship between people, cultures, and lived environments. The students, Runa, believe that respectful sharing of goods, traditions, and knowledge is a natural and powerful way to grow sustainably as a global community. UNESCO and Conservation International both recognize the Ecuadorian Amazon as one of the top 10 most biodiverse places on the planet. Each year, over 3% of the Ecuadorian Amazon is deforested. The oil mining industry has long legacy of regional exploitation and destruction. The Global Climate Program data shows that deforestation accounts for 25% of global emissions of heat-trapping gases contributing to climate change, and slash and burn agriculture is the leading cause of tropical deforestation. However, cross-country comparisons show agricultural GDP growth is more than twice as effective at mitigating the effects of poverty vis-a-vis other economic generating activities. Few organizations are able to balance the need to create productive, sustainable livelihoods for local people while conserving the environment. Innovative strategies that jointly support income generation for smallholder producers while maintaining the ecological integrity of the Amazon rainforest are critically needed. This is the passion and purpose of Runa...simply stated. Employ a field team of 10 indigenous agronomists who provide over 600 farming families technical supportin sustainable harvesting, nursery management, and organic guayusa agroforestry systems. Created a non-traditional start-up business funding plan by raising over $350K from USAID, Ecuador's National Government's Export Ministry (CORPEI), DED (Ecuador's Dept of Economic Development), GTZ-Ecuador (German Gov't fund for sustainable worldwide economic development - Gesellschaft für Technische Zusammenarbeit) and local governments. Uses virtual communications to keep the USA and Ecuador operations in synch, like skype and other communications and social media. Within 5yrs of operating in Ecuador, Fundacion Runa plans to reforest more than 5000 hectares of guayusa agroforests and work with more than 5000 family farmers. Their sales/distribution model is also innovative. In addition to traditional channel, e.g., Whole Foods, independent natural food distributors, etc., Runa is engaging college-age students and other volunteers to promote and sell Runa at their colleges and communities. More than just selling product, Runa would like these 'ambassadors' to create communities that share the morning ritual together and form a close community that can reach out and help the community around it. Runa is also supporting internships and volunteers. Volunteers primarily work in the diverse nurseries of organically grown tree & fruit species and help technicians and engineers in creating and maintaining organic agroforestry plots. This all takes place at Runa's Conservation, Training & Research Center near Puyo, Ecuador. 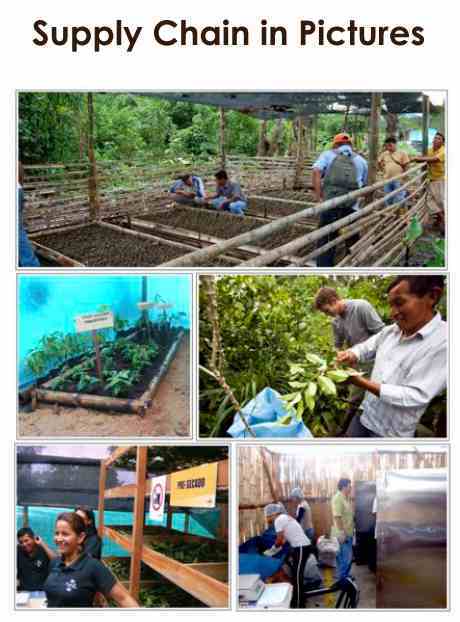 Volunteers also partner with the field team to visit local family farms, participate in cultural events and guayusa tea ceremonies and create their own research projects. The way guayusa is grown is also a bit different from most crops. It is grown sustainably in agroforestry plots in between food staples and hardwood trees! The leaves are harvested by hand from the rich soil under the Amazon Rainforest canopy. Guayusa is made from the leaves of the caffeinated Amazonian holly tree (ilex guayusa), which is not related to the tea plant (camelia sinensis) which makes green and black tea. Guayusa is related to the yerba mate (ilex paraguariensis) from the Atlantic rainforest around Argentina, but has a smoother taste than yerba mate. The challenges have been typical of most start-ups - raising money, finding the right people etc. One big challenge has been educating people in the USA about Ecuador. Most Americans lump Ecuador in with Venezuela, Bolivia, and Cuba as socialist or fascist. However, the current government, led by Rafael Correa is working hard to increase economic development as a means to stabilize the country. Runa has a strong, positive relationship with the government at several levels, including their grand from the Export Ministry. The Ecuadorian Ministry of Production recently picked Runa as 1 of 12 finalists for a $1.25 MM grant with 80% likelihood of approval and the Ministry of Economic Development approved a $900,000 grant to the Guayusa Farmer Association, which Runa helped organize. To balance the relationship with the Ecuadorian government, should a significant change in direction arise, Runa's very close and trusting relationship with the indigenous farmers, who they are helping to rise out of poverty, positions them with a critical political constituent base. Another challenge being overcome is gaining attention with the large 'natural' retail chains - like Whole Foods. Runa has used its network of friends, family, alumni, and its board of advisors to get access to various retail and distributor channels. Runa's board of advisors is strong, including people who have held executive positions at Stonyfield, Safeway and Pepsico. Finally, raising money is never an easy task, but they continue to tell their story - demonstrating how one can do well and do good simultaneously. The benefits to consumers will increase as more and more people drink guayusa, but let's first go over the 'traditional' benefits, tho it's hard to say anything is traditional from a 'business' standpoint. Distribution contracts with Whole Foods Mid-Atlantic, Associated Buyers Distribution, numerous tea shoppes, cafes, farmers markets, natural food stores, universities with further contracts pending with Whole Foods' other regions. Follow your passions and using common, and un-common sense. Paradoxical thinking (my words, Roger Martin calls it "opposable minds") is the way some of this generation thinks by default - how wonderful! How fabulous! What hope and encouragement this should provide to all of us who read this and of course, drink the wonderful tea (which you can buy at runa.org!). Am I biased because of where these kids went to school? Do I think that had something to do with their view that anything is possible? Of course, I must admit that. But this is the case with students all over this country - and we must encourage and harness this entrepreneurial magic. Credits - well, on one level, you have to credit the families these kids came from - families that taught, nurtured, and encouraged these kids. One also needs to give credit to their peers and professors at Brown, such as Danny Warshay and others, who make being entrepreneurial 'natural'. And credit must go to the students - to Tyler, Dan and Charlie - for pursuing their passions and not giving up. Personally, I must thank Danny Warshay for introducing me to Dan. We were having coffee at Blue State Coffee (on the first floor of my freshman dorm) - and they do carry Runa Tea - when this 'kid' stopped by to ask Danny something. The kid was Dan MacCombie and I've been honored and privileged to work with Dan ever since that serendipitous meeting several months ago. It is an incredible gift to be able to give back institutionally and individually and working with Runa has been a blessing - demonstrating the vitality and relevancy of my alma mater and incredible hope for the future. Thanks for sharing this story. It's truly inspiring! I have mixed feelings - I think Bschools need to teach skills & practices - e.g., you should learn some basic accounting etc. What these kids do have are families with biz backgrounds and a lot of help from profs at Brown & Mentors - so they had an 'ad hoc' biz school so to speak. It depends on the kids - for some I've seen they can just go for it, for some, a little time in the corporate world helps them learn - I tell them if they want some corporate experience to view it as 'grad school' where you get paid nicely! Thank you for your comments - go get some tea! Very impressive. Working in the Amazon with communities can be difficult, so I appreciate the integrity of their model. Thanks for this post and the reminder that innovation often departs from traditional limitations, Deb. What a credit to Brown University ('08) grads - reminds me of Frank Sinatra's "Their Way! Deb - I so agree with you that GIVING BACK is the new GOING FORWARD! Thanks for modeling it so well in this wonderful story. Many many more innovators find hope and courage in the words!